In addition to anticipating a visit from Santa, invite your child to BE a Santa for others. What gifts can they create themselves, with just a little assist from you? *Gifts from the toy box – The holidays are a great time for kids to donate some of their gently used games, clothing or other items to children who are less fortunate. Even preschoolers can be taught to pick a few toys they’ve outgrown to donate to children who don’t have any. December is the perfect month for this exercise, since your kids will probably have some new holiday gifts coming into the toybox very soon. This process will teach them to be discriminating with the things they retain, and it will help keep clutter out of your home. It’s a win/win, mom and dad! *Christmas helpers – If you give gifts to other people, ask your children to assist with the baking, wrapping and labeling. *Random acts – Consider making it a family affair to create Random Acts of Kindness during the holiday season. Kids can definitely be involved in that wonderful practice. 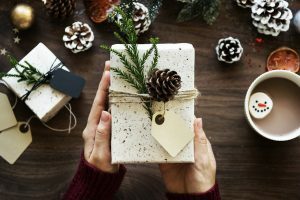 The Christmas hug – Here’s one of my favorite Christmas past stories: When my son, James, was about six years old, he was introduced to the idea of creating experience coupons to give as holiday gifts. I will never forget the Christmas he presented me with a small, wrapped piece of paper. He was all smiles as I opened it and read the words aloud. “One free hug from me whenever you need it. Love, James” Granted, this might be a gift only a parent (or grandparent) would actually appreciate, but boy did I appreciate it! My son was SO proud that he had gifted me with something only he could give: one of his precious hugs, and I was thrilled to be the lucky recipient. Everyone was a winner!